Found 4 item(s) authored in "1976". Author(s): Guy Wienzapfel, Nicholas Negroponte. Architecture-by-Yourself is an experiment in computer aided design that applies the medium of computer graphics, used by a general populace. The research program confronts the delicate balance between insightfulness and paternalism toward a user who ultimately bares the risk. 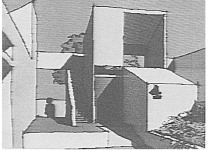 The paper reports on a case study, on the underlying philosophy's of the French architect Yona Friedman, and on a computer implementation called YONA. As part of a larger research effort, Machine Recognition and Inference Making in Computer Aids to Design, we postulate further developments that will exercise input and visualization techniques in a relentless setting, relentless in the sense that the user is demanding, the problem is hard, and the product is a personal, one-of-a-kind design.